The four small bays and beaches of Collioure are flanked by a 13th century castle and a medieval church. This most charming and picturesque town full of tradition and history captivated the imagination of painters Matisse and Derain who stayed in Collioure in 1905. 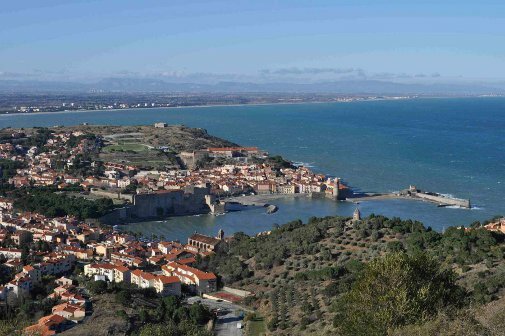 Our holiday rental is located at a prime position on the perimeter of Collioure. Guests will experience beautiful views of the surrounding hills, olive groves and vineyards undisturbed by commercial development. The apartment features modern decor and furnishings, spacious surroundings and the use of an outdoor swimming pool (during the summer months). Fully equipped kitchen, Sky UK television, balcony with picturesque views and comfortable sleeping conditions for up to 6 adults. Please feel free to navigate this site to see what our apartment and Collioure has to offer.